Be the first to share your favorite memory, photo or story of Jason. This memorial page is dedicated for family, friends and future generations to celebrate the life of their loved one. 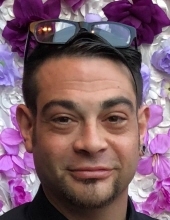 Jason C. Corino, 37, died Tuesday, April 9, 2019. Born in Passaic, he lived in Lyndhurst before moving to North Arlington 5 years ago. He worked as a plumber’s assistant for Around the Clock Plumbing in Kearny. Jason was the devoted son of the late Maryann Corino; the loving boyfriend of Jessica Hoyt; the dear brother of Jonathan Corino and his wife Danielle; the loving grandson of Mildred Corino ( nee Verola ); the adored uncle of Alyssa and Dylan Corino, Bentley Geier, Jonathan and Nicholas Mitchell, and David DeCarvalho; the adored godfather of Austyn Geier and Vincent Wirth, and the caring nephew of Judy Corino ( nee Holdsworth ). Jason is also survived by Burt, Clair & Christopher Hoyt, and his beloved fur baby, Boomer. He leaves behind his cousins, Steven Corino and his wife Jacqueline, and their daughter Stella, Matthew Corino and his wife Kristina, and their children, Emily, James, Jacob and Hannah, and Kyle Corino. He was the friend of James & Kimberly Monti, Philip & Megan Geier, Jonathan & Melissa Mitchell, Jamie Messina , Allen Hubler, Rachelle Russomanno, Edson DeCarvalho and many other cherished friends. Relatives and friends are invited to attend the Funeral Service at the Parow Funeral Home 185 Ridge Rd., North Arlington on Saturday, April 13th at 4:30 p.m. Visitation will be held at the Funeral Home Saturday 1p.m. until time of Service. In lieu of flowers the family would appreciate donations made to the Juvenile Diabetes Research Foundation 26 Broadway, 15th Floor, New York, New York 10004 or the Bergen County Animal Shelter 100 United Lane, Teterboro, N.J. 07608. To send flowers or a remembrance gift to the family of Jason C. Corino, please visit our Tribute Store. "Email Address" would like to share the life celebration of Jason C. Corino. Click on the "link" to go to share a favorite memory or leave a condolence message for the family.